As you progress into fiber art crafting/quilting, you discover it is nice to have more than one sewing machine. There are some sewing machines I just plain out WANT but can't justify the expense. Part of my challenge to myself is to keep this craft as inexpensive as possible. Buying the majority of fabric secondhand is one way and finding vintage sewing machines is another. I squealed when I saw the baby blue color. I didn't even open the case all the way, I just drug/carried it to the front from the back of the store where it had been hiding under a table. This guy is heavy! I couldn't test it as one of the cords is deteriorated and needs replacement. The light bulb is intact, there is no rust and the belt looks to be in good shape. On auction, I had been eyeing an orange Husquavarna in its case. But total cost would end up to be around $200-$250 and a tune-up for $100-$150. The expense on the Morse will total $150-$200. Of course, both machines would hold their value once repaired and maintained. My neatest find of late - this collection of embroidered red thread squares. I think a red plaid would look adorable with these. In any craft, you revel in what truly makes you happy. I am at my happiest when I can create a quilt top loosely following a composition from a 1960s artist. With the Art with Fabric blog hop coming up next month, I am halfway through my first flimsy. It is my intention to enter this quilted wall hanging in next year's California State Fair. My second quilt top I would like to base on the start-with-a-square concept. I would really have to step up my free motion quilting game, I am hoping the Morse will be an easier machine to work with. What makes you happiest when you are crafting? This was first named wallflower quilt because that is how I think of pale yellow or gray fabric creations. Next name came to mind was Picnic Quilt because I intended it on being a large square, but it ended up being a twin bed sized or large lap quilt. For the backing, I went "all me" using pineapple print and My Little Pony flannels. I am an adult MLP fan and thought "why not?" use that remnant fabric to finish off this quilt. I had all sorts of difficulty at the quilting stage. I thought all the blocks had squared up but Nooooo, and the gray thread I chose was lackluster. When I switched to dark blue thread for quilting on the diagonal, it was the right choice. I thanked quiltinggail.wordpress.com for posting her diagonal quilt finish. It caught my eye because it was a serpentine stitch but my Singer let me work only in straight line. This is an end of summer quilt that I am keeping. Because of the flannel backing, it has some heft to it. It was an experiment of combining color outside of my comfort zone. It is neither a masterpiece of piecing nor quilting, but when everything came together - it was like a symphony. Since I am finding pieced work and nearly finished blocks in my thrift shop wanderings, I am merely sewing those pieces together and supplementing from my stash or retail fabric. I went a little over thrifting budget to buy this Pfaff serger ($22.50). This item has been on my thrift shop bucket list for some time now. I grabbed it when it was being rolled out for sale. At the very least, it is threaded which I have read is half the battle with these machines. Finding entire quilt kits means I have done very little piecing this summer. This Coastal Beacons set has supplemented two quilts and a quilt in progress so far. One quilt challenge I wanted to complete this year was the Pantone color of the year but ultra violet was my undoing, I had none of that in my stash. Here is a link pantone-2018-challenge-winners with a heavy emphasis on matchstick quilting and modern design. Participating in the 2018 Monthly Color Challenge has pushed me into making pieced blocks. I had promised my daughter another quilt. I made one for her a couple of years back but it is an early work fraught with numerous mistakes and questionable fabric color choices. (Link here quiltorama.) I will be posting my progress on this quilt in the weeks to come. 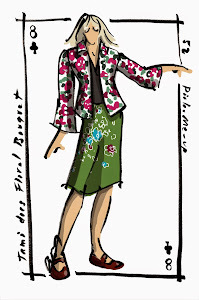 The Art with Fabric Blog Hop is happening again (a twice yearly event) in November. That motivated me to finish the picnic quilt so I could begin my creation. The one thing I want to do is incorporate a solid color and I chose Kona's Caribbean blue. 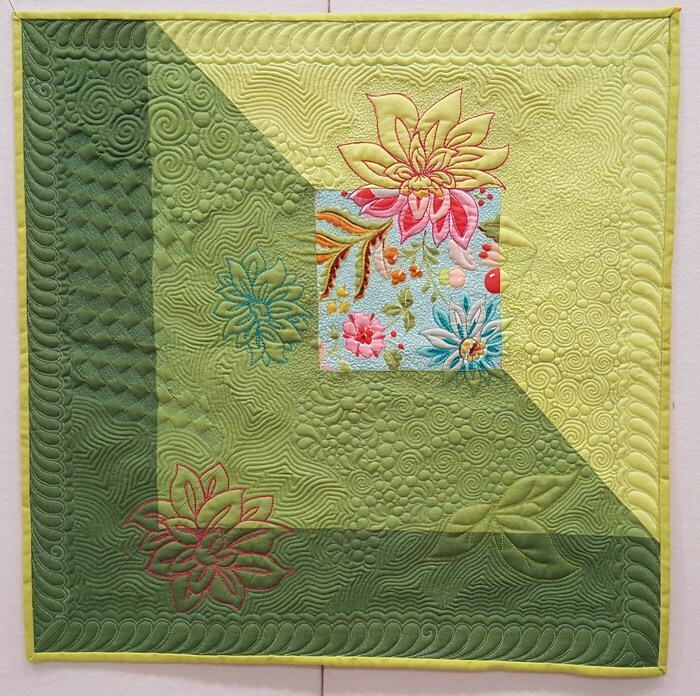 I do know I will be doing matchstick quilting again - it really makes a wall quilt pop! 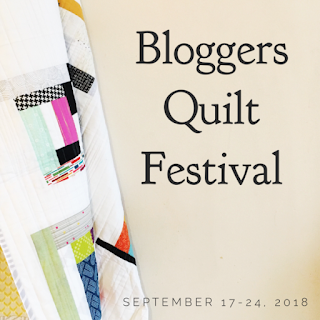 Apologies to my audience on this re-post but it has to be a new one for entry into the Blogger's Quilt Festival. I am furiously binding my picnic quilt for a second entry into the festival, will I finish in time? This is my Indianapolis Colts Quilt, first posted here. I began with less than a yard of scraps from the Mr.'s daughter. The backing was flannel colts and a plaid. It is interesting that as a I gain experience quilting (now nearly 5 years under my belt), that my tastes have changed. 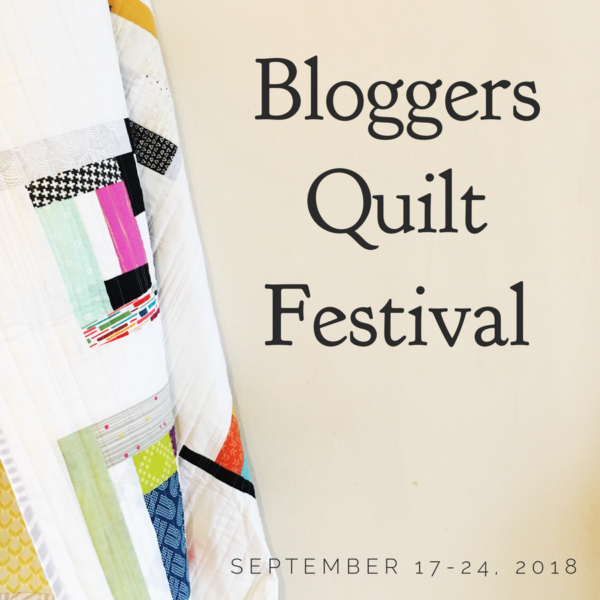 In the beginning, I was easily wowed by anything and everything that was posted by quilt bloggers and pinners. As you develop your own technique, you gain a discriminating eye. Ya'll know what I mean, that experienced quilter is going to see right off that your points don't match and fabric meant to point one direction heads off in another. I greatly appreciate when other quilters post about their travails and struggles with certain quilts. It seems some projects go together easier than others. Now go and visit all of those other wonderful fiber artists! I had so wanted to finish a quilt this weekend but my usual machine went sideways. For some reason, free motion quilting is beyond its capabilities. Perhaps that is a good thing, as it is hard on my wrists too. Quilting provides many different activities one can do during the creative process. You can be cutting the fabric to the lengths needed, patchwork piecing, squaring up the blocks, assembling the quilt top, sewing together the backing, putting together the quilt sandwich, basting, quilting and binding. I chose to do piecework. This is a test block for my daughter's quilt. The finished size is 8" but when I refine it (and do it correctly from the pattern book), should measure as a 12" block. That quilt will have more of a fall palette. Linking up with Jen at patternsbyjen.blogspot.com for the September Color Challenge. Half off day at Hospice thrift was a romp. The contents of the box totaled $6.50, with two genie glass containers (already filled with the colored pebbles), a set of Hawaii ornaments, a record, two books and a pair of shorts for my son. I have been working my way through my fabric remnants, cutting them into 2-1/2" squares. This activity will result in two quilts, one a watercolor (or color wash) and the other a leaders/enders. What fun things have you been working on?